What is aural rehabilitation (also called aural rehab or A.R.)? Aural rehabilitation, often referred to as aural rehab or A.R., encompasses a wide set of practices aimed at optimizing a person’s ability to participate in activities that have been limited as a result of hearing loss. Some hearing healthcare professionals use an aural rehabilitation model in their work with clients. Such an approach to hearing health care often begins with a thorough audiologic evaluation and includes the prescription of a primary device such as a hearing aid or cochlear implant. Rather than relying solely on hearing aids or cochlear implants to solve hearing problems, however, the aural rehab approach uses a Needs Assessment to help the person with hearing loss pinpoint specific situations that are highly valued and at risk for being compromised by difficulties with hearing, even with excellent amplification. These are usually the important experiences in a person’s life that present difficulties with understanding speech in the presence of noise, which challenge one’s ability to maintaining attention and focus, and/or which contribute to listening fatigue and internal stress reactions when communication breakdown occurs. Importantly, aural rehabilitation invites the active participation of the person with hearing loss in setting goals, identifying satisfactory outcomes and choosing solutions. Once the Needs Assessment is complete, aural rehab helps the person with hearing loss to organize and actively take charge of communication by creating a hearing loss management plan. The person with hearing loss can begin to tackle the obstacles presented in important communication events and try out and evaluate possible solutions. Those might include the use of hearing assistive technology and/or captions, communication strategies, auditory training sessions to build stamina for listening and sustained attention, relaxation techniques, and peer support groups (i.e. HLAA Chapters) to build confidence, skill sets, and social support. and, steps that include working with a professional, such as face-to-face coaching with an auditory training specialist (which can be a teacher of the deaf and hard of hearing or a speech/language pathologist). The benefits of using comprehensive A.R. practices have been shown to be significant. 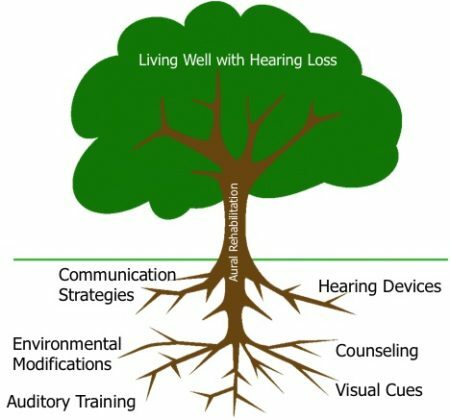 Aural rehab can reduce one’s perception of hearing difficulties, improve one’s perception of quality of life, help one to become a more effective user of hearing technology and communication strategies, and improve one’s personal adjustment to living with hearing loss.